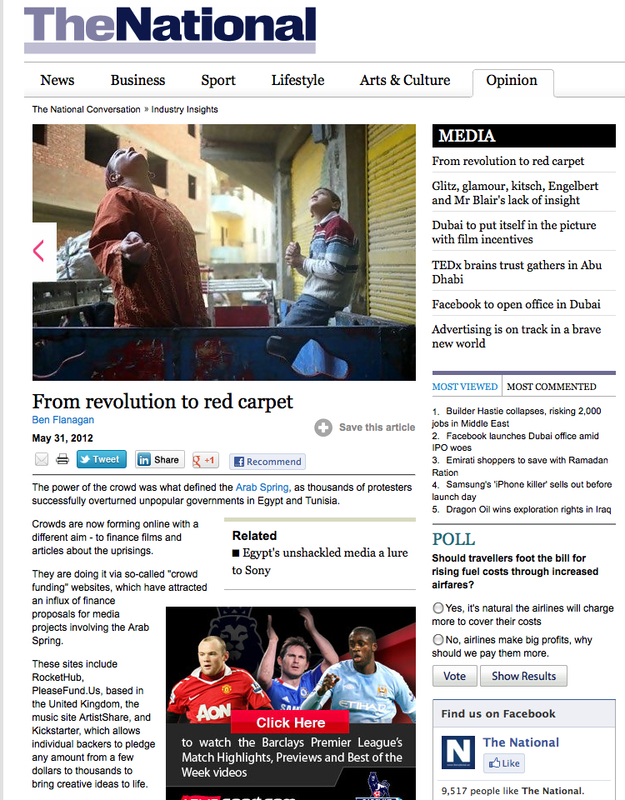 Today, Zabaleen got a bit of press in The National UAE. Writer Ben Flanagan reached out to us to learn about our experiences with Kickstarter. We had a great conversation and the article is quite good. Take a look HERE. Thank you so much for helping us make this dream come true. And to let you know we certainly haven’t forgotten all of your rewards. We have the prints and posters ready to ship but we want to make sure we do our research and ship them in the best possible way to avoid damaging the artwork. We’re in a really great place with the edit right now and have high hopes that we will have the film finished by the end of September. More updates coming soon! Just last week, we had the honor of being invited to speak about ZABALEEN at Harvard’s Peabody Museum and show some work-in-progress scenes from the film. Justin and Carrie were on hand to intro the scenes and participate in a panel discussion and Q&A about the film and their experiences in filming within the community. All of the details about the event can be found here. We had a great turnout and we want to thank everyone for their support. It was the first time that anything has been shown publicly and we received a lot of great feedback, which was very encouraging. If you weren’t able to join us and would like to listen to the audio recording of the panel, you can do so by clicking here. Have a listen and let us know what you think! If you have any questions, be sure to leave a comment and we’ll answer them to the best of our ability. We’ll have some photos to post, and maybe a little video – so stay tuned. We are very proud to have been invited by THIMUN (The Hague International Model United Nations) Qatar Film Festival to speak to aspiring filmmakers about our experiences while making ZABALEEN. Director, Justin Kramer will speak to the filmmakers as well as showing some clips from the edit thus far. We have the great honor to announce to you that we will be screening a “work in progress” and holding a discussion at Harvard’s Peabody Museum on April 5th. The event is free and open to the public so if you are in the Cambridge, MA area, please come join us. The Peabody Museum of Archaeology and Ethnology, the Center for Middle Eastern Studies, and the Semitic Museum present film clips and conversation, “Garbage City and the Informal Economy,” on Thursday April 5, 2012 at 6:00 pm at Northwest Lab, Rm. 103B (52 Oxford St., Cambridge). The free event will be followed by a public reception. Just when we think our friends, fans, and family have shown us the most love possible…. You surprise us yet again. 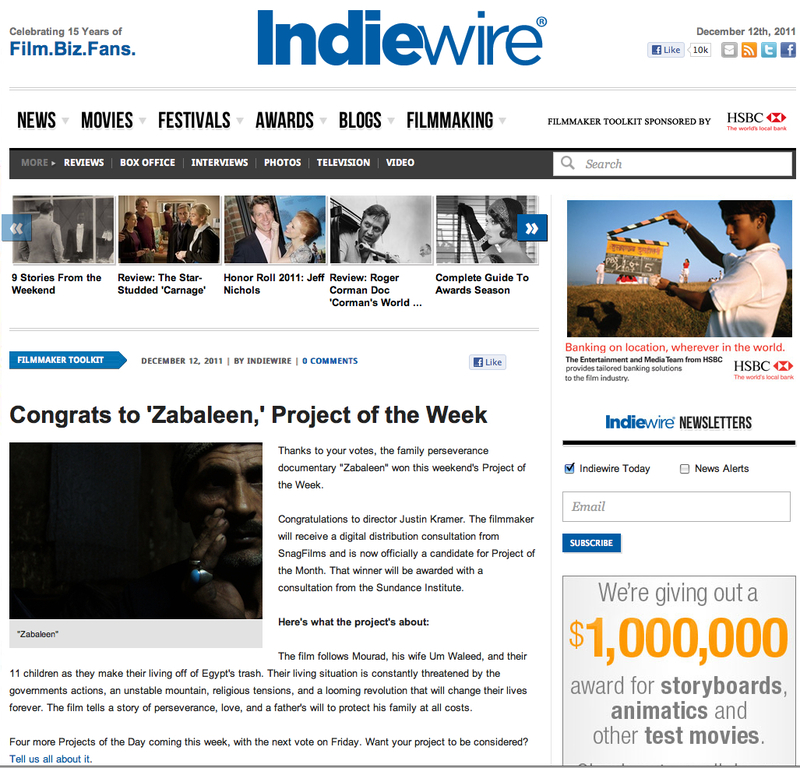 Thanks to you, we were recently named IndieWire’s “Project of the Week”. There is one more step that we will need your help for though. At the end of the month, IndieWire will host another poll where we will be up for “Project of the Month”. The winner of this title gets a free consultation from the Sundance Institute. We would love to get this opportunity and with your continued help and support, we are very confident we can do it. Thank you all so much again. We are so grateful. This past week we were pleasantly surprised to be featured as IndieWire’s “Project Of The Day”. As we mentioned, voting would open today…. So we really need your help in the voting. If you have a Facebook page, its as easy as a click of the mouse. If we win, we would be qualified for “Project Of The Month”!!!! This would be massive for our film and we would be forever grateful for your vote. We are surprised and honored to be featured as IndieWire’s PROJECT OF THE DAY today! Please check out the page and leave a comment about the film. Also, at the end of the week there will be a vote on “favorite Project of the Day” where we could win some really great opportunities thanks to IndieWire. Join our ZABALEEN mailing list! If you want to receive emails with updates on the ZABALEEN PROJECT, sign up for our mailing list!